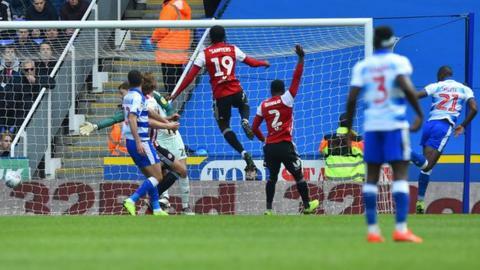 Yakou Meite scored two first-half goals as Reading beat Brentford to boost their Championship survival hopes. The Royals' top scorer placed his first underneath Luke Daniels before beating the Bees' goalkeeper again with a glancing header minutes later. The hosts were cruising to half-time until Emiliano Martinez gifted Neal Maupay his 26th goal of the season after he spilled Said Benrahma's free-kick into the path of the striker. Martinez made up for his earlier error to keep his side in front with two quality saves to prevent Sergi Canos and Mads Bech Sorensen grabbing an equaliser in the second half. Jose Manuel Gomes' side burst out of the blocks at the Madejski Stadium before Meite latched onto Mo Barrow's clever through ball give them an early lead. The Ivorian then met Lewis Baker's flighted free-kick to head in his fourth goal in as many games. On-loan striker Nelson Oliveira then provided Barrow with a golden opportunity to score but the winger failed to connect with the striker's cross in front of an empty net. A late surge by Thomas Frank's Bees created some nervy moments for the hosts, but the Royals managed to hold on and move four points above the relegation zone. "We are at the end of the season, four games more, so (it was a) very important three points for us. "We deserved it the way we played. We could have finished the game in the first half. In the end everyone was a bit nervous and with their coroners and free-kicks. "My players were brave, they fought in the end of the game, they kept the three points. "We cannot relax. Now we can celebrate for a few hours and after working again...collect all our energy and prepare for Friday's game against Bristol." "The positives are that we were better in the second half. "We have to do everything we can and that will mean a lot for this club, this team and every individual. There is no reason not to do that."